Our service this morning was led by Revd Diana who helped us celebrate the last chapter in the story of the Christian Church. Once called ‘Stir up Sunday’ we now know it as ‘Christ the King’ when in their beautiful red stoles, the Revd’s Diana and Carolyn performed the last of the eucharist services for this year… In her address, Revd Diana, told us how she loves to read stories to her young granddaughter especially one entitled ‘Spot the Dog’ who manages to go missing but thank-goodness is eventually found… Revd Diana said that we all love stories and we especially love happy endings. We tell out our life in stories, and today is the final story in the churches calendar, where Jesus is raised up as Christ the King, a story, during which we hear how Jesus is the story of the church especially when he was recognised by Pontius Pilot when he questioned Jesus on his status asking if he was ‘King of the Jews’. Therefore, it is our duty as Christians to tell that story. Next week, the First Sunday of Advent we start anew as we await the birth yet again of our Saviour. Did the story of Jesus’ life have a happy ending? To the Jews, maybe not, as they were under the rule of the Roman Empire and desperately wanted a war-leader, instead of which God offered them a different leader, one who could give them a new start. A faithful servant bringing love, hope and the joy of the Kingdom of Heaven. So, although the story of Jesus did not have a happy ending thus far, we still have hope that the happy ending will come through the promised Kingdom. There was hope, love and a happy ending in store for some of the children of fathers who reside in Chelmsford Prison, for today many of us helped support the Charity called ‘Angel Tree Gifts’ where we were asked to donate presents and money so that the children who live in unsettled families are sure to receive a Christmas Gift. 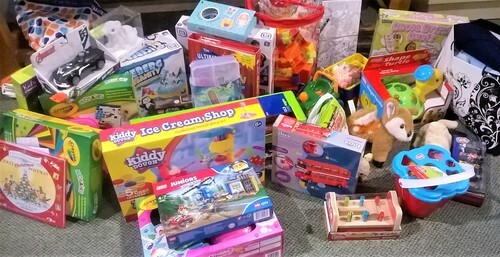 During the service, Revd Carolyn called up all those who had brought gifts and donations and had them all placed in the Lady Chapel where she thanked people for their generosity and blessed the toys where they will stay until they are picked up during the week… Thank you to everyone who entered into the spirit of the Angel Tree Gift appeal.